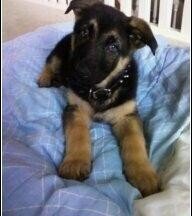 Attached is a Blackberry photo of my GSD Morrison, in this photo he is 7.5 weeks old, and has yet to become a holy terror! He is very curious, confident, and playful. Morrison is quickly learning to obey most commands that I have taught him, you know the basics. At the time of this submission, he is 10 weeks and has become the holy terror I expected, just kidding. Morrison is quite well behaved, he is almost fully house trained, knows sit, stay, and NO. He also is doing very well with the leash, he can only hold up to about a 15min walk, but with -20 temperatures that is just fine with both of us! Morrison and I will begin kindergarten in the New Year and then begin training in Search and Rescue, if we pass muster that is.